Okay, so my mama never cooked anything with rhubarb in it in her life. I don’t think. But rhubarb is something that you *hear* a lot about as a kid in the South even if you have absolutely no idea what a rhubarb looks like. BTW, it looks like a pink stick. The pinker the better. If you have access to decent rhubarb (God, I miss The Berkeley Bowl being 2 blocks from my house), this is the perfect Valentine’s Day dessert, especially if you’re not absolutely crazy about chocolate. And don’t get me wrong, I am. Sometimes I just want something a little different. While this dessert came out looking nothing like the picture that attracted me to it (shocking, I know), it did end up tasting really yummy… I’ve made it a bunch of times now and usually omit the whipped cream to make it just a bit healthier. I also don’t mix it all together at once – I keep the fruit mix in tupperware and the mix it up with yogurt as I go – this way if I feel the urge to eat it for breakfast, I can! But of course, if you want an cool looking dessert and don’t care about the whipped cream, because hey! It’s Valentine’s Day! then go all out…. and double the whipped cream. You’ll thank me. 1. 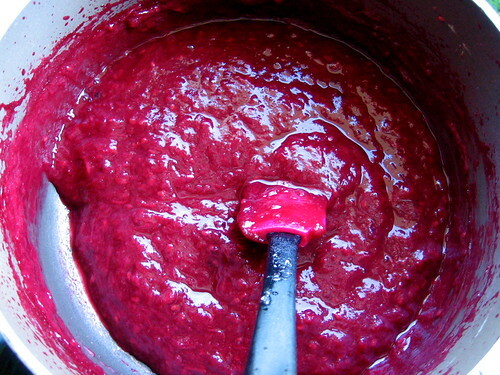 Combine rhubarb, 1 cup berries, sugar, OJ, and cinnamon in a saucepan. Bring to a simmer over medium-high heat, stirring constantly. Reduce heat to medium low, cover, and cook 5 minutes stirring often. Remove lid and cook 3 to 5 minutes or until rhubarb is tender and mixture has broken down into a chunky puree, stirring often. Let cool completely. 2. The recipe originally called for draining yogurt in a sieve. Eh. Whatever. Do such things if you wish, but… I don’t think it did all that much. 3. Chill mixing bowl in freezer to aid in whipping cream. 4. Fold yogurt into rhubarb mixture with spatula. Whip cream in the chilled bowl. Fold into the rhubarb-yogurt mixture, leaving distinct swirls. Spoon into desert dishes, and garnish with wafer crumbs and the rest of the blackberries. I am not crazy about fools; when you say you keep the fruit mixed up in a bowl in the fridge so you can eat it anytime, do you then cook it to a pulp? Do you just cook it lightly? At just what stage of preparation is that delicious looking bowl of fruit in the second picture? It already has some yogurt/cream poured over and has cookie crumble on top. When I put it in the fridge, I cook it to the state you see in the first picture. I’m sure if you wanted, you could keep it a little less cooked down than I do. Basically, I just cook it like the first step and then stop. And the second picture is actually the “starting photo” – that’s all the ingredients (sugar, cinnamon, oj, and fruit) poured into the pot to cook. Before you wrote back, I tried a modified version. 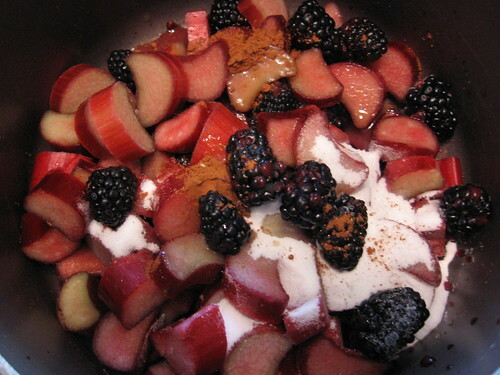 I cooked the rhubarb, berries, cinnamon, sugar, and orange juice–only I added about three times the amount of orange juice. I cooked it gently for about 5-7 minutes, just long enough for the rhubarb to be tender (the fruit remains in whole pieces). I let it cool in its own juice, and then added the fresh berries, vanilla yogurt, and ginger cookie crumbs as I served it. It was wonderful! Most recipes for rhubarb are too sweet. This limited amount of sugar (the added sweetness of the orange juice helps) made the perfect sweetness. This may become my standard rhubarb recipe. Hmmm, maybe next time I’ll try out decreasing the cooking time. I like this recipe because it’s not sickingly sweet – I like my fruit with a good bit of tartness. I think that’s why it’s so good with the crumbled cookie – it contrasts nicely with the tart fruit.